Mansfield, 76 vs. Oliver Ames, 24 – Final – Mansfield swept the 55M dash, led by Greg Waters’ first place finish in 6.92. Joe Cappelletti and Aidan Sacco took second and third, respectively, for the Hornets. Jack Rivard (37.90) and Dan Knight finished first and second in the 300M, both setting personal best times. Patrick Heavey won the 2 Mile with a Hockomock-best time of 9:57.18, Colbey Eason won the shot put 47-09.00 and sophomore Nico Holmes had a big PR with a toss of 39-05.00 to take third place. Attleboro, 57 vs. King Philip, 43 – Final – Attleboro swept the 55M dash and went first and second in three more events to earn a close win over King Philip. Humza Habib (6.95), Dante Williams, and Colin Levis were the top three finishers in the 55M dash for the Bombardiers while Levis (37.33) and Habib came in first and second in the 300M, Alex Paradise (5-08.00) and Ethan Shangraw were first and second in the high jump, and Shangraw (18-07.00) and Demar Dunn went 1-2 in the long jump. King Philip swept first place in the distance events with Mike Griffin winning the 1000M in 2:37.59, Eric DiLorenzo crossing first in the 1 Mile in 4:44.00, and Michael Norberg taking the top spot in the 2 Mile in 10:22.88. Franklin, 55 vs. Taunton, 45 – Final – Franklin swept the 1000M race to highlight a close win over Taunton. Senior Michael Hagen set a new personal best time at 2:47.65 to win the race with classmate Nicholas Zaffino just 0:00.02 seconds behind. Senior Dylan Kehoe rounded out the top three for the Panthers. Andrew Faught (8.80) and Nicholas Mazzarella went 1-2 in the 55M hurdles for Franklin. Taunton’s Sebastien Celestin was a double winner, taking first in both the 55M dash (6.89, PR) and the 300M (37.50, PR). Milford, 70 vs. Canton, 25 – Final – Milford took first and second in four events and swept the high jump to earn a win over Canton. Anton Luckett won the high jump at 5-04.00 with Sean Lehane and Tiago Filadelfo taking second and third, respectively. Milford’s Hugo Lopes (37.48) and Rafaell Feliciano went 1-2 in the 300M, Ryan Kelley (1:31.53) and Anthony Ghalbouni were first and second in the 60M, Maxwell Manor (4:46.07) and Anthony DiStauro went 1-2 in the 1 Mile, and Miguel Torres (10:24.13) and James Comisky were the top two finishers in the 2 Mile. Canton’s Nate Quan was first in the long jump (19-04.50) and Cam Sanchez won the 55M dash (6.97). Sharon, 82 vs. Foxboro, 17 – Final – Sharon won eight individual events and both relays to record a big win over Foxboro. Isaiah Stessman was a double-winner for the Eagles, taking first in the high jump (5-04.00) and the 55M hurdles (8.17, PR). Foxboro senior Will Regan won the 600M in 1:27.08. North Attleboro, 54 vs. Stoughton, 46 – Final – North Attleboro swept the 1 Mile and took first and second in the 2 Mile to earn a close victory over Stoughton. Liam Monahan won a pair of events for the Rocketeers, clocking in at 4:40.56 to win the 1 Mile with sophomore Jackson Magas taking second and sophomore Kyle Robinson coming in third. Monahan won the 2 Mile in 10:25.10 with junior Daniel Nobrega taking second. Stoughton took the top three spots in the 55M hurdles with junior David Peters (7.91) coming in first, sophomore Christopher Ais taking second, and junior Anthony Pizzano clocking in third. Mansfield, 75 vs. Oliver Ames, 25 – Final – Mansfield senior Amanda Mangano won three events for the second straight meet, helping the Hornets beat Oliver Ames. Mangano won the 55M dash (7.66), high jump (5-00.00), and long jump (16-06.50). Hornet sophomore Grace Fernandez cut off nine seconds to PR in the 600 to take first, Maggie Riley had a personal best time to win the 1 Mile and senior Zoe Plante shaved off nearly a half a second for a PR to win the 55M hurdles. Attleboro, 31 vs. King Philip, 69 – Final – King Philip swept the the 600M race, won both relays, and took first and second in three more events to pick up a win over Attleboro. Sophomore Grace Crocker set a new PR, clocking in at 1:50.68 to win the 600M with junior Liliana Rolfe and junior Brianna Quirke taking second and third. The Warriors earned the top two spots in the 55M hurdles (Abigail Dunne and Victoria Priestley), the shot put (Bailee Ziolkowski and Sarah Vigevani) and the high jump (Paige Berdos and Dunne). Attleboro’s Abisola Olaogun won both the 55M dash and the long jump (PR, 15-09.25) for the Bombardiers. Franklin, 47 vs. Taunton, 53 – Final – Taunton won six individual events as well as the 4×400 relay to edge Franklin in a tight meet. Sophomore Olivia Dias was a double winner for the Tigers, winning the 55M dash (7.77) and the 600M (1:45.27) while Kerla Sylvestre won the 300M (43.46), senior Maggie Sullivan was first in the 1000M (3:17.26), Annabella Chavez had the top toss in the shot put (29-02.00), and Victoria Gravel won the long jump (15-10.00). Franklin’s Daniella Pierre was a double-winner, taking first in the high jump (4-10.00) and the 55M hurdles (8.92). Milford, 76 vs. Canton, 20 – Final – Milford’s 4×200 relay team of Kerry O’Connor, Sydney Sutton, Sarah Flanagan, and Sienna Pierce set a new school record with a time of 1:49.35 to highlight the Scarlet Hawks’ win over Canton. O’Connor also won the long jump (16-04.00) and the 300M (42.16), Sutton took first in the 55M dash (7.57), Flanagan was second in both the 55M dash and 300M, and Pierce was fifth in the 55M dash and third in the 300M. Canton’s Bronwyn Mahoney won the shot put (30-05.50), Chloe Pennacchio took second in both the 1 Mile and 2 Mile, and sophomore Lauren Sullivan placed second in the 600M with a PR of 1:56.41. Sharon, 60 vs. Foxboro, 36 – Final – Sharon junior Jada Johnson continued her dominant season, this time winning three events to help the Eagles pick up a win over Foxboro. Johnson took first in the 300M (42.71, PR), the 55M hurdles (8.51, PR), and the high jump (5-04.00) to pace Sharon. Foxboro junior Isabell Hallal ran a PR in the 600M, clocking in at 1:50.06 to win the race. North Attleboro, 75 vs. Stoughton, 16 – Final – North Attleboro swept three events on its way to a big win over Stoughton. The Rocketeers took the top three spots in the 55M dash (Vanessa Ibarhim, Emily Nardelli, Meagan Dowd), the 300M (Tess Collins, Lily Wetherbee, Sam Hawkins), and the long jump (Wetherbee, Celine Ibrahim, Hawkins). Stoughton sophomore Katrina Billo was first in the 1 Mile in 6:21.38. NORTH ATTLEBORO, Mass. – North Attleboro had the right defense in place and the pitch out of sophomore Bella Erti’s right hand was in the right spot. But Braintree’s Meghan Duffy got just enough of the pitch, the two-out bloop single falling just fair in no man’s land in right field, bringing two runs across. That was all the damage the Wamps did on the scoreboard, and despite a seventh-inning rally from the host Rocketeers, it was enough for a 2-1 victory for #9 Braintree. 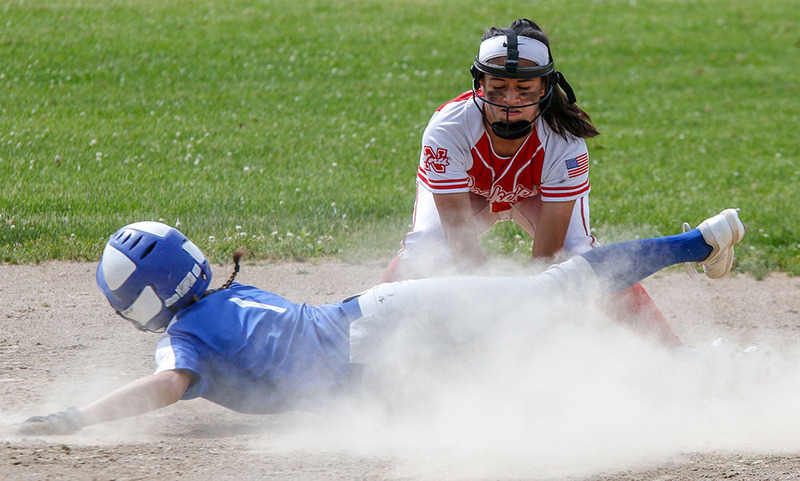 “It was an inside pitch and she just fisted it out there,” said North Attleboro head coach Bill Wallace. Barry, in fact, didn’t issue a base on balls and struck out 11 Rocketeers. North had just two hits through six innings before nearly coming back to tie the game in the final frame. Sophomore Abby Gallagher led off the inning with a double to left to start the rally and classmate Ashley Cangiano followed with a hard hit single through the right side for a single, putting runners on the corners with no outs. Sophomore Annabelle Hebard grounded out to shortstop but Gallagher came racing home, cutting the deficit to 2-1, while Cangiano took second. Barry put an end to the rally through, striking out the next two North Attleboro batters to secure the win. Erti was equally as good to Barry, allowing just four hits with one walk and six strikeouts. Braintree orchestrated its two-runs with a leadoff single from Barry before Erti got the first out with a strikeout. Lily Adams reached on an infield error and courtesy runner Delia McGuire advanced to second. On a ground ball from Kara Paquin, McGuire was called out after a collision with North Attleboro freshman Emily Nardelli, keeping runners at first and second with two outs. But Samantha Hayes drew a two-out walk and Duffy followed with the bloop double. Olivia Capobianco led off the fourth inning with a bunt single and ended up on second after a throwing error. Gallagher’s groundout to Capobianco at third with just one out but Barry once again got a big strikeout and then a soft liner to short to end the threat. North Attleboro softball finishes the season at 16-5. FRANKLIN, Mass. – Franklin came into Monday’s Memorial Day matinee with North Attleboro needing a victory keep alive hopes of reaching the postseason. After punching in a run in the bottom of the seventh to force extra innings, throwing a runner out at the plate to stay tied in the ninth, and escaping a bases loaded jam in the top half of the 10th, the Panthers were just 60 feet from the win. Senior Meghan Caron, the lone Panther player celebrating senior night before the first pitch, stood at the plate with Tara Hartnett poised at third. Caron hit a chopper towards the left side of the infield and North shortstop Emily Nardelli had to come home with it, but Hartnett was off on contact and slid in ahead of the throw. Franklin pulled out a 4-3 victory that split the season series against the Rocketeers and also sends the Panthers into the season finale knowing that a win will clinch a spot in the state tournament. It was a back-and-forth game from the start. The Panthers took the lead in the bottom of the first thanks to an unearned run. Allie Shea (3-for-5) got it started with a single to left and Anna Balkus beat out a bunt single. Nardelli made a diving stab of a Maddie White grounder up the middle to get a force at second but a bobble on a grounder off the bat of Hartnett brought Shea home. North took its lone lead of the game in the third inning. Olivia Capobianco singled with one out and stole second. Abby Gallagher followed with a walk and then Ashley Cangiano lined a double into right center than scored one. North coach Bill Wallace held up Gallagher, as the Franklin relay got the ball in quickly, but Bella Erti helped her own cause with a single that drove in both runners for a 3-1 advantage. Franklin cut the lead in half in the bottom of the inning. Balkus and White singled to start the inning and, after a force at third to get the lead runner, Hartnett singled to right to drive in White and make it 3-2. After the third both pitchers settled into their starts. Erti retired 12 straight Franklin hitters from the third to the seventh inning and finished the game with eight strikeouts. Cherry kept the Rocketeers off-balance, moving the ball around and although she walked eight hitters, she also struck out 15 and didn’t allow a run over the final seven innings. The inability to tack on insurance runs came back to haunt the Rocketeers in the seventh. A one-out walk to the nine-hitter Gabby Colace got the rally started. Shea followed with a single to left and both moved up into scoring position on a groundout to first by Balkus. White hit a bouncer to short that Nardelli bobbled for a split second before firing to first. It was a bang-bang play at the bag and White was ruled safe, allowing the tying run to score. North nearly broke the deadlock in the ninth. A one-out walk to Gallagher was followed by a blast to center by Cangiano that one-hopped the fence. This time, Wallace elected to send the runner, but the relay from Balkus to Hartnett to catcher Maggie Hobby was perfectly executed to cut down the go-ahead run at the plate. Franklin put two on in the ninth as well, with one-out singles by Shea and Balkus but Erti got a pop on the infield and a strikeout to end the threat. The Rocketeers threatened again in the 10th. Katherine Munley drew a walk and with two outs Andrea Miceli lined a single to left. After Abby Warren drew a walk, the bases were loaded but Cherry was able to bear down and struck out Capobianco to keep the game tied. In the bottom of the inning, Hartnett singled to start the inning and moved up to second on a wild pitch. She failed to move up a base on a hard grounder to the right side by Kylie-Jade Bouzan but went to third on a second wild pitch. That gave Caron the chance to be the hero on senior night. Franklin (9-10, 8-8) will have one last game against Bridgewater-Raynham on Wednesday night. If the Panthers win, then they are in the playoffs. North Attleboro (15-3, 11-3) will face Davenport division champ Milford on Thursday. Attleboro, 1 @ North Attleboro, 3 – Final – Click here for a Recap and Photo Gallery from this game. Foxboro, 8 vs. Coyle & Cassidy, 2 – Final – Click here for a recap of this game. King Philip, 2 @ Bishop Feehan, 15 – Final – Pat Limerick had three hits on the day but the Warriors fell on the road to Bishop Feehan. One of Limerick’s hits was a solo home run while Jeremy Rhines also chipped in with three hits and an RBI for the Warriors. Sharon, 4 @ Milford, 7 – Final – Click here for a photo gallery of this game. Mansfield, 16 @ Bridgewater-Raynham, 1 – Final – Mansfield’s offense used 12 hits, four walks and took advantage of four Trojan errors to pick up a big win on the road. Mansfield broke open a scoreless gae with four runs in the fourth and added seven more in the fifth. Although the Hornets had 12 hits, only one player – Tyler Dalton (three RBI, two runs) – had more than one hit. Ten other Hornets each had one hit with Chris Jenkins and Kyle Moran providing two RBI and a run scored each. Connor Sheehan earned the win, striking out seven with just two walks and three hits allowed in five shutout innings of work. North Attleboro, 5 @ Attleboro, 1 – Final – Bella Erti struck out 13 and walked just one, while going 2-for-3 at the plate with a homer and two RBI, leading North to the Blue-Red Cup title. Abby Gallagher also went 2-for-2 and drove in three runs, while Olivia Capobianco had two hits and scored two runs and Emily Nardelli, Ashley Cangiano and Katherine Munley each had a hit. 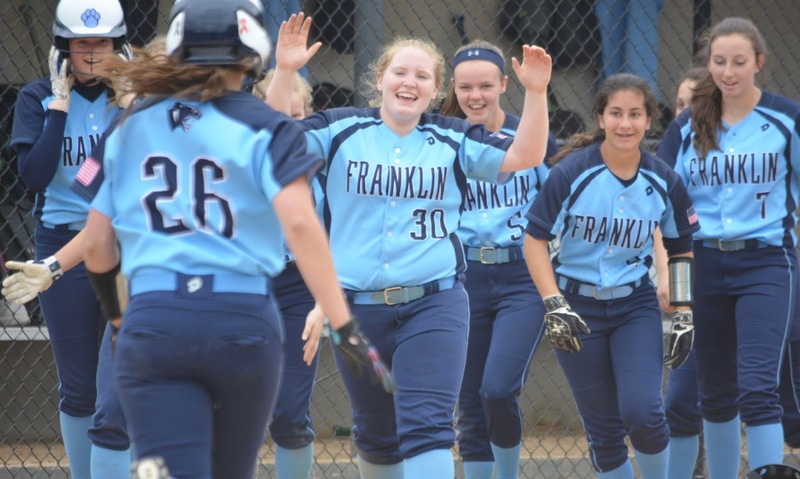 Franklin, 0 @ Bridgewater-Raynham, 3 – Final – Franklin had the same amount of hits as Bridgewater-Raynham but couldn’t string them together to find a run. Both teams had five hits but the Trojans cashed in on a couple of unearned runs. Jackie Cherry had two hits for the Panthers while Maggie Hobby had one and made two nice catches in foul territory behind the plate. Emily Valentino allowed five hits while striking out four. Mansfield, 8 @ Duxbury, 4 – Final – The Hornets opened the game with three runs in the first, added three in the fifth and scored a pair of insurance runs in the seventh to pick up the road win. Mady Bendanillo drove in the first run with a double and scored on a double by Felicity McMullin, who scored on a single by Caty DeMassi. In the fifth, Kara Bendanillo again got it started with a single and Megan beat out a bunt to put two on. Mady Bendanillo doubled again, driving in two more runs and then she scored on a sac fly. In the seventh, Letendre and Mady Bendanillo singled and moved up into scoring position on good base-running. McMullin plated one run with a slow roller on the infield and Bendanillo scored on a wild pitch. Sharon, 0 @ Milford, 28 – Final (5 inn.) – Click here for a photo gallery of this game. Franklin, 12 @ Canton, 5 – Final – Franklin built a 7-1 lead after 24 minutes of play and never looked back to finish its regular season with a win on the road over Canton. Eric Civetti netted seven goals and had three assists while Jake Davis scored a hat trick and had two helpers for the Panthers. Foxboro, 6 vs. Wayland, 15 – Final – Click here for a recap of this game. Sharon, 12 vs. Cambridge, 0 – Final – Eight different players found the back of the net for Sharon and Jonny Greenberg recorded a shutout in the Eagles’ win over CambridMitchellchll Director scored a team-high three goals while Kadin Nestler had two goals and two assists. Daniel Lilenfeld added a goal and two assists for Sharon. Stoughton, 1 @ Milford, 14 – Final – Click here for a photo gallery of this game. Canton, 1 @ Franklin, 20 – Final – Katie Jones led Franklin’s offense with four goals and two assists as the Panthers picked up a win at home. Lilly Kolb added two goals and an assist while Haley DeStefano found the back of the net twice for the Panthers. North Attleboro, 12 vs. Old Rochester, 16 – Final – North Attleboro was tied 7-7 at the half but Old Rochester broke the game open with a strong second half. Kayla Moulin made 11 saves in the game, including the 300th of her career. Camille Pizarro scored five goals, Julia Dakin had three and Mackenzie Rosenberg had a pair for North. Sharon, 18 vs. Cardinal Spellman, 2 – Final – Lydia Chase led the Eagles with five goals and an assist, while Emma Eberhardt played provider with six assists. Sabrina Robbins had a hat trick, while Mia Lappen, Abbi Solomon (two assists), and Jenna Goldstein all scored two goals apiece. Maeve Barbera added one goal. King Philip, 4 vs. Bishop Feehan, 1 – Final – King Philip dominated doubles play, losing a combined five games and winning both matches in straight sets to defeat Feehan. Sean Desroches and Nate Ihley won 6-0, 6-1 at first doubles and the team of Nick Ihley and Aidan Ignatius notched a 6-1, 6-3 win at second doubles. Nick Putney prevailed with a 7-6, 3-6, 6-4 win at second singles and Jack Cannon lost just one game (6-0, 6-1) in a victory at third singles. Sharon, 2 @ North Attleboro, 3 – Final – North Attleboro’s Ben Pfeffer and Vikram Senthilakumaran emerged from an epic three-set match at first doubles with a win to clinch a victory for the Rocketeers as well as a perfect league record. Pfeffer and Senthilakumaran won 6-7 (3), 7-6 (4), 7-6 (3) to clinch the Davenport title for Big Red. With North’s win, Sharon’s run of 38 straight years with a league title comes to an end. Richard Bermudez won 4-6, 6-4, 7-6 (1) at first singles and Christian Bermudez picked up a 6-1, 6-0 win at second singles. Sharon sophomore Danujan Thirumavalavan won 6-2, 6-0 at third singles and the team of Ashwin Sreevatsa and Arie Chinnappan picked up a 6-1, 6-3 win at second doubles for the Eagles. Foxboro, 1 @ Martha’s Vineyard, 4 – Final – Foxboro’s Sophia Prinos picked up a win at first singles but the Warriors fell to Martha’s Vineyard. Prinos earned a 7-6 (6), 6-4 win for the Warriors’ lone point. North Attleboro, 0 @ Sharon, 5 – Final – Sharon defended home court with a sweep of North Attleboro, winning all five matches in straight sets. Nupur Shukla won 6-0, 6-3 at first singles, Lulu Yuan earned a 6-1, 6-1 win at second singles and Katie Merport recorded a 6-0, 6-3 win at third singles. The Eagles’ first doubles team of Emily Wen and Sachi Bhasin won 6-1, 6-0 while Rithika Neti and Sophia Fein picked up a 6-3, 6-1 win at second doubles.